A medium-sized raptor, adult plumage is similar between the sexes and can be highly variable, ranging from very dark to very pale. Upperparts are mottled brown and underparts are generally paler with a variable amount of dark barring. The brownish tail shows a series of dark bands and usually a distinctive dark sub-terminal band. Pale patches on the underwing are often noticeable. Juveniles have similar plumage to the adults but with more pronounced streaking on the breast. 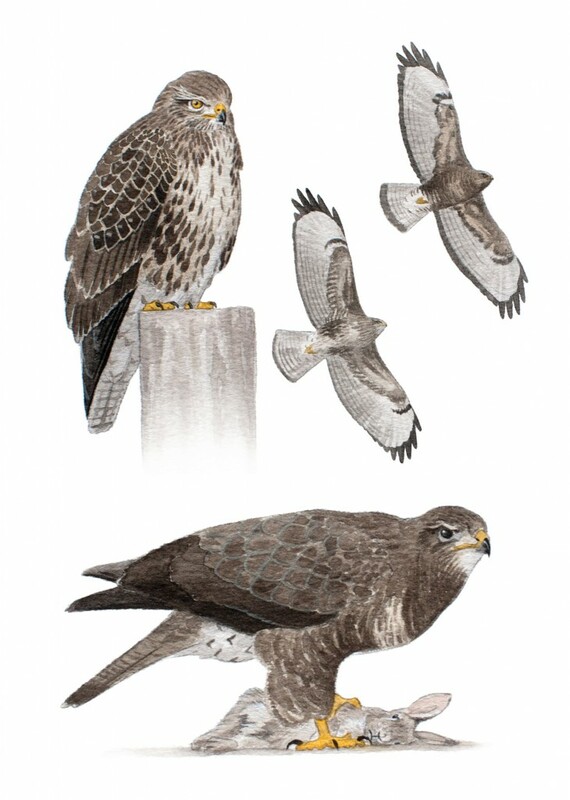 Buzzards can be found in many habitats in the uplands and lowlands but typically in landscapes with small woodlands suitable for tree-nesting. They are generalist hunters with a cosmopolitan diet including birds, mammals, amphibians, reptiles, invertebrates and especially scavenged carrion. Often seen perching on fences and posts by the roadside waiting for ‘road-kill’.